The system is powered by a quad-core 3.7 GHz Intel Xeon E5 processor. The Mac Pro also has 12GB of 1866 MHz DDR3 ECC RAM and 256GB of PCIe-based flash storage. There are also dual AMD FirePro D300 graphics cards with 2GB of GDDR5 discrete VRAM each. You'll be able to connect to the Internet with fast-speed 802.11ac Wi-Fi. The Mac Pro also supports a/b/g/n Wi-Fi networks as well. The Mac Pro also features built-in Bluetooth 4.0, which allows you to connect wireless headphones, keyboard, mice and other compatible peripherals without a hassle. Mac Pro Desktop Computer (Quad-Core, Late 2013) is rated 4.5 out of 5 by 26. Rated 5 out of 5 by Rhod from Very Powerful Workstation I purchased this MacPro Quad core to replace my aging MacBook Pro 2011 model. It is used primarily for music production. This is my first Pro Mac since owning a G4 tower years ago and I am very pleased with my decision. I was on the fence deciding between the latest iMac i7 with Haswell CPU and this one and I'm glad I decided to get the Pro! The benefits over the iMac are: it is expandable to 64Gb RAM (compared to 32gb for the iMac), it supports 4k displays (even though I have no need for one now, I'm sure prices will come down and. unlike with the iMac, I'll be ready), and the upgradable Xeon CPU. In addition, the ECC RAM and Xeon CPU provide a level of stability that desktops just do not. The only things weighing in favor of the iMac were: the amazing 27 display and the relative cost for a somewhat comparable configuration. Overall, though, the Mac Pro is worth the extra expense for longterm upgradability and stability. Highly recommended! Rated 5 out of 5 by Corey from Amazingly fast! I was trying to decide between the new Mac Pro and the 27 inch iMac. The new Mac Pro runs Final Cut and Aperture at blazing speeds. Thunderbolt 2 is a delight (upgrading from Firewire ). Very happy with my purchase. B&H shipped very quickly, a pleasure to do business with. Rated 5 out of 5 by Midwest Dave from Fast, quiet, powerful This replaces my old 2009 MacPro and it is at least 2-3x faster at most tasks. The SSD drive averages between 800-900MBs read/write! The system boots in 4 seconds, apps load instantaneously and having Thunderbolt 2 drives attached I get incredibly fast storage now as well as the ability to run 4K displays. Biggest bonus is being able to run it all day with low power consumption and very little heat even when doing heavy tasks such as video encoding or working in Lightroom. Rated 4 out of 5 by Anonymous from Very Happy Though I did have to wait a long time for it to arrive I was excited to receive my new Mac Pro. Even though it's the baseline model it still spits out renders faster than my fully upgraded machine at work. It looks pretty and works like a beast. What more do you want? Rated 5 out of 5 by Anonymous from Mac Pro Computer I am an a mechanical engineer and I purchased the Mac Pro for working at home. I use it a minimum of 12 hours per day and I love the Mac Pro computer more than any other I have ever owned. The Mac Pro has allowed me to work at home with incredible efficiency (I actually get more done than I did when I worked with others in an office) via the use of Pages, Numbers, Keynote, Preview, iTunes (all included), and my drafting software (not included). The computer occupies minimal room on my desktop yet stores everything I need from drafting work to X-rays to microscope photos as well as standard workplace correspondence. Further, the computer operates my drafting software and wireless printer/plotter flawlessly, and with EXTREME speed. I've never experienced 3D model rendering or the copying of gigabyte size files completed so quickly. It's simply amazing. The Mac Pro is equipped with plenty of ports for peripheral gear such as a CD burner, camera card reader, music recording interface, or thunderbolt compatible external hard drives (great for backup), and provides 4 ports for the use of multiple monitors (I use 2 thunderbolt monitors). Unlike some computers I have owned in the past, no sophisticated setup or software is needed or necessary to operate multiple monitors; the Mac Pro configures them automatically and immediately when connected. Not only is the computer compact, it generates very low levels of heat and is comprised of a component cooling fan that I have yet to hear. As such, it does not add heat to the office or interfere with any voice or music recording one might perform. The processor is super fast, unbelievably fast compared to my prior computer, and definitely faster than any laptop I have ever used. Further, it is a beautiful piece of gear with its black mirror finish. I am unable to cite a single complaint about the Mac Pro nor do I have any regrets about purchasing the computer from B&H Photo. I received EXCELLENT service, purchased an EXCELLENT product, and now enjoy EXCELLENT computer performance! The Mac Pro is, without doubt, the best computer purchase I have ever made and is arguably the best innovation in computers since computers became affordable to the general public. I would recommend the Mac Pro over any other stationary Mac computer and definitely over any PC for any purpose. You simply can't purchase a higher quality computer. PERIOD!! You cannot get yours soon enough!! Rated 1 out of 5 by Louis from Graphics/Video card freezes The graphics/video card freezes sporadically. ?Its a known issues for this machine that we only realized after purchasing it. ?B&H should not sell this defective machine. Rated 5 out of 5 by Whiterider from Mac Pro This is not only a work of art it is a spectacular machine. First Mac that I have ever owned that is completely silent. Faster than a blinking an eye. Literally starts in five seconds. Powerful almost be on belief. Rated 5 out of 5 by Charles from Great Savings! I have been wanting to upgrade to MAC PRO to run my ProTools home DAW for sometime and when I saw this for $1000 off I had t buy. I am not disappointed, using with a 34 monitor and can open mixer and recording windows in a large size, no problems with processing power to run plugins and outboard gear. I upgraded ram from stock 12GB to 16GB for about $30 ( one 4GB stick) and that is enough for now. fastest boot and program load times I have ever seen. Could I get the same student discount online that I would get from Apple Retail store? Mac OS X El Capitan or macOS Sierra comes in this computer do you get a choice? Will this with either OS's work with Final Cut Pro 7? NO no choice it came with Sierra. I would not recommend this Apple Computer Period . The situation of the turn ON button is ridiculous and only allows you to look at all the wires facing you on the back. My daughter and I both bought one and we both have had problems. It won't recognize my large Epson printer and easy to access on my screen. I had several Mac's over the years and this one is BAD!!!! Would this be able to smoothly cut RED r3d 4K footage in fcpx? Multicam too? 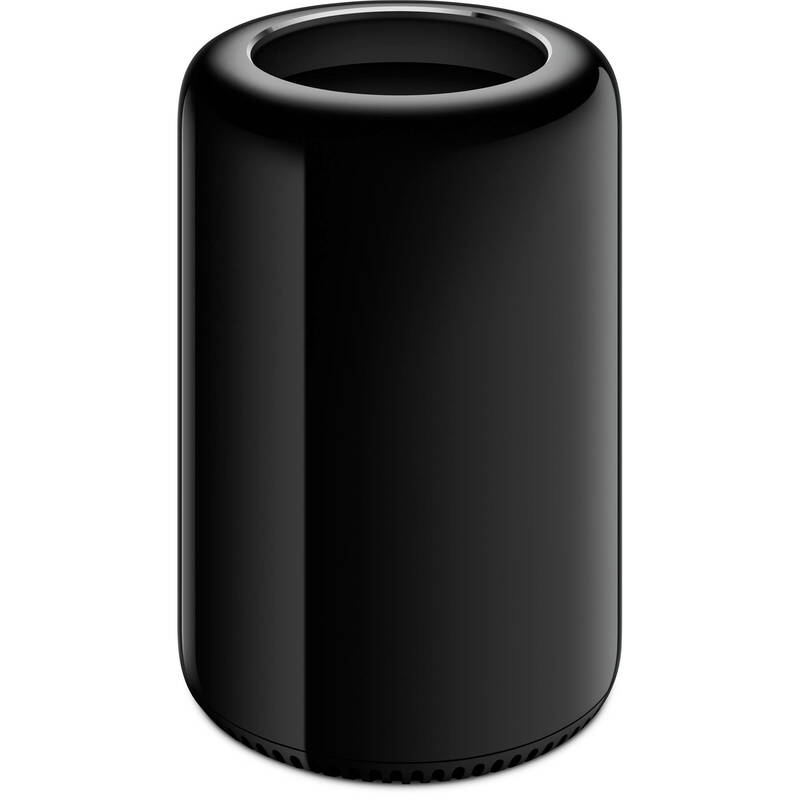 I have a 2012 MacBook Pro and I need a Mac Pro trash can but want to make a smart move. Everythings shot on a RED Scarlet X or phantom 4 drone. Just need something to handle the heavy footage, both raw and proxies. Assuming you are shopping for the model with 12GB of RAM and 256GB SSD I would plan on upgrading the RAM and disk as it may not be enough. My wife purchased this model for photo editing and we ended up having to upgrade the RAM to 64GB and SSD to 1TB plus to keep things working smoothly. She uses Adobe Photoshop and FinalCut Pro for video and the stock RAM and SSD weren't up to the task. Does it output Optical for Audio 7.1 surround? Not likely. Other World Computing sells the only upgrade and it's not cheap. What sort of adapter gizmo do I need to connect multiple Firewire external HDs to this beast? I am planning to use it to run adobe creative cloud (especially multicam function comes with Premiere Pro ), and Davinci resolve as well. Would this Mac pro be fast enough? Thank you ! The performance of the Late 2013 Mac Pro Xeon E5 processor family in 4, 6, 8 or 12 core versions are geared towards optimal performance in professional applications like Final Cut Pro X, Adobe Premiere, DaVinci Resolve, AutoCAD, Maya, Cinema 4D R15, Logic Pro X, Aperture, and Motion among others. The combined system architecture and I/O of the Late 2013 Mac Pro is designed to ensure that if you use any of these applications, you will get through your workflow faster and with greater reliability and flexibility than any other computer in Apple's lineup, or even comparable PC-workstations.